Note: this episode was recorded in 2016, prior to the US presidential election. Kristie Dotson will be coming back in a future episode to give us her latest thoughts on these topics in light of recent developments in US politics! 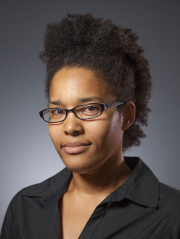 This month, we talk to Kristie Dotson (Michigan State University) about how people’s ability to gather and share information can be negatively impacted under oppressive social systems. Click here to listen to our conversation. We human beings rely on each other for most of our information. I think I can say I know that Tanzania exists–in fact, according to our records, someone from Tanzania has listened to this podcast–even though I’ve never flown out there myself to check. How do I know? I get information about what’s happening there by a mix of historical records, news reporting, testimony from people who have been there, and even testimony from people who come from Tanzania. What’s more, this information about what’s happening in the world that I learned from testimony is often of crucial importance, both for me and other people. It affects my voting decisions, to be sure, but it can also impact my day-to-day decisions. Join us as our guest walks us through how both having knowledge and having other people know things about you assumes a level of key importance in today’s politics! I would love to learn more about this issue because it is important but unfortunately, I can’t access this podcast because I am a deaf sign language user. I suppose this is an example of epistemic oppression because of the lack of accessibility for people who can’t hear but I can’t be sure because I don’t know how you are defining this. Is there be a transcript of this talk posted somewhere? In the meanwhile, I will get in touch with a friend of mine who is an expert on accessibility and see what she says. And please let me know if you have any other suggestions. This was eye opening for me. thank you.